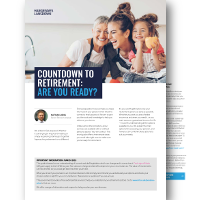 Even if retirement is a little while away, our factsheet is worth reading to help you make the most of your pension. This factsheet is not personal advice. This factsheet is not personal advice. If you are unsure, please seek advice. What you do with your pension is an important decision, which could be irreversible. Drawdown is a higher risk option than an annuity. Make sure you understand your options and check they are suitable for your circumstances: take appropriate advice or guidance if you are unsure. The Government's free Pension Wise service can help. It provides impartial guidance face-to-face, online or by phone - more on Pension Wise. Investments can go down as well as up in value, so you could get back less than you put in. Money in a pension is not usually accessible until age 55 (57 from 2028).